. . . and then there is the person. bid cut to a knife, find matter. This poem responds to today's prompt at Magpie Tales: Francesca Woodman's It Must Be Time for Lunch Now (1979). The epigraph is taken from a note Woodman wrote on an early print: "There is the paper and then there is the person." To participate in today's prompt or read other contributors' poems, go here. In art there is no progress, only fluctuations of intensity. For a selection of "20 of the best" quotes by the late art critic, go here. Today's edition of Saturday Sharing sends you to an electronic tour guide to Smithsonian Institution museums, tells you where to go for The Straight Dope, introduces you to list-making at Book Riot, gives a hoot to bardowl's audiobook app, travels through a Ploughshares's series on literary boroughs, looks into date-inspired posts at The American Literary Blog, and leads you to a site that will stretch the boundaries of your knowledge. ✦ Friends coming to the Washington, D.C., area for the first time often include the Smithsonian Institution museums on their itinerary. Given the number of museums, a little advance planning can help make the visit more memorable. Where to start? Check the Smithsonian Tour Guide and Visitors App at iTunes. ✦ The site The Straight Dope aims to stamp out ignorance by providing need-to-know answers to your most pressing questions. ✦ Like lists? Book Riot, dedicated to all things about books and reading, offers a weekly round-up. Here's an example. ✦ The blog for the literary magazine Ploughshares is running a series called Literary Boroughs. The "little-known and well-known" literary communities explored to date include Washington, D.C.,(#11) Philadelphia (#7), Brooklyn (#5), and Berkeley, California (#9). The series continuess until the next AWP conference in Boston next year. ✦ Nineteenth Century American literature is the focus of Rob Velella's The American Literary Blog. Each post, according to Velella, a self-described literary nerd, is inspired by an anniversary (birthday, death, publication date, etc.). Velella has a particular affinity for obscure writers, and what he uncovers is often fascinating. ✦ German artist Heike Weber uses strings of white silicone to create extraordinary installations that look like kilims; see a selection of images here, here, here and here (other images are listed under "Installations" on Weber's Website). The artworks were inspired by a visit to Turkey. Weber's "forest" paper cut-out also is wonderful. ✦ Visual artist and historian of photography Brenton Hamilton, Rockport, Maine, offers superb examples of what can be done with the 19th Century cyanotype process. Hamilton's work is featured in his book The Blue Poet Dreams. ✦ A book version of the Smithsonian Institution's wonderful online project click! photography changes everything has been published jointly by Aperture and the Smithsonian. 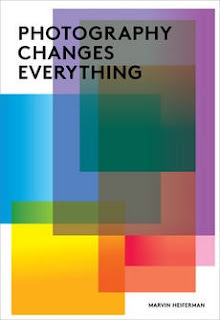 Featured in the book Photography Changes Everything are more than 300 images and nearly 100 text pieces (from the likes of John Baldessari, John Waters, Robert Adams, and Hugh Hefner) that explore the influences of photographic imagery. ✦ The nonprofit Silicon Valley Art Museum is devoted to presentation of online art exhibitions and online education in the arts. Be sure to check its comprehensive Resources for artists. ✦ In this video from Interview magazine, Alex Katz talks about how he became a painter. An exhibition of Katz's work, "Alex Katz: Give Me Tomorrow", which included paintings, collages, and cut-outs from the 1950s to the present, concluded earlier this month at Tate St. Ives. This TateShots interview at the artist's New York City studio, complemented the exhibition. ✭ We're lucky Washingtonians! The exquisite costumes conceived in rag paper by Isabelle de Borchgrave are on exhibit in "Pret-a-Papier" at Hillwood Estate, Museum & Gardens through December 30. The beautifully crafted artworks represent dress (for both men and women) dating to the late 17th to early 20th centuries. Be sure to see Creations on de Borchgrave's Website, where you'll find many images of paper dresses and shoes, other paper objects (e.g., paper vases), paintings, pleated work, sculptures, design, and more. ✭ The New Orleans Museum of Art is presenting through December 2 "Photography, Sequence & Time", which looks at how meaning, narrative, and time intersect in photographic sequences from the 19th Century to the present. ✭ In Phoenix, Arizona, the Heard Museum continues its exhibition of the work of painter and sculptor Dan Namingha, sculptor Arlo Namingha (son), and conceptual artist Michael Namingha (Dan Namingha's youngest son, who focuses on digital ink-jet prints on canvas and paper): "Landscape, Form, and Light: Namingha Family". The work of these acclaimed Hopi artists remains on view through January 27, 2013. Many of the objects on display are available for purchase at the museum's Berlin Gallery (contact the museum's shop). American Indian Artist Profile - Dan Namingha from Christine Victa on Vimeo. Michael Namingha talks in this video about his creative influences.
. . . You experiment with the world through your poems.
. . . I've written lots of poems looking to understand myself. . . .
She lives now in Paris, France, but the window through which she looks daily, says Syrian poet Hala Mohammad, who left her country to obtain treatment for breast cancer, is, as she wrote in her poem "This Fear", a window that "opens to alienation", fear, and the loneliness experienced because of exile. In the video below, "Hala Mohammad: Waiting for Spring", part of "Artscape: The Poets of Protest" series from Al Jazeera, Mohammad, who has published more than a half-dozen collections of poetry, talks about her life in Paris, her family, the ongoing political crisis in Syria, her artistic struggles, and why she believes poetry holds an answer to loss, despair, and, inevitably, change. Poetry, she explains, "really does leave an impression. . . A poem of love can have an effect, can help you feel beauty. . . Until now weapons are stronger than us. Maybe they are faster. . . But I think poetry will endure." An interview with Hala Mohammad about her documentary Journey Into Memory (2006) can be found at a blog of the Center for Contemporary Arab Studies. Intimate, with often moving recitations of poetry, the "Poets of Protest" series includes profiles of five other poets from the Middle East: Ahmed Fouad Negm of Egypt ("Ahmed Fouad Negm: Writing a Revolution"), Yehia Jaber of Lebanon ("Yehia Jaber: Laughter is My Exit"), Manal Al-Sheikh of Iraq ("Manal Al Sheikh: Fire Won't Eat Me Up"), Mazen Maarouf, a Palestinian ("Mazen Maarouf: Hand Made"), and Al Khadra, who lives in the Algerian desert ("Al Khadra: Poet of the Desert"). of rice in two, quarter no quarter of apple. pressed newly small as Chinese feet. the girl dying to be the woman seen. It took His body to become your bread. Congratulations to Emily on the publication of Chasing Silhouettes: How to Help a Loved One Battling an Eating Disorder. Emily's blog is imperfect prose. we leave behind is as good as, if not better than, the one we found. ~ Closing Statement, "What Next for Sustainable Development"
Think ahead 1,000 years in the future. Now try to imagine the great City of London under water. If you were asked to conceive of how climate change might have changed the world so many years from now, would a submerged London have occurred to you? It did to British artist Michael Pinsky, who envisions the deleterious effects of climate change as Plunge. Produced by Artsadmin and LIFT for Imagine 2020, an arts network supporting the use of artistic work to explore the causes and effects of climate change, Pinsky's conceptualization involves wrapping a string of low-energy blue LED lights around three monuments in central London — Duke of York Column, Paternoster Square Column, and Seven Dials Sundial Pillar — to demonstrate, simply and quite elegantly, one possible result of uncontrolled climate change: a Thames River that has steadily risen — 28 meters (91 feet, 10-3/8 inches) above current sea level, in Pinsky's scenario — until it has overtaken the capital. Our ability to forecast such dramatic change as Pinsky envisions remains limited, although our imagination does not; and there is hardly consensus, scientific or otherwise, that climate change even exists. What data we do have, however, should give us pause and underscore the point Pinsky makes: Doing nothing is not an option. we know to name and touch. More than a dozen poets from the United Kingdom have penned contributions for Metamorphosis: Poems Inspired by Titian, published this past June by National Gallery Co., which commissioned the poems for the National Gallery, London exhibition "Metamorphosis: Titan 2012". That exhibition concluded September 23. The poets, selected by a panel headed by A.S. Byatt, were invited to respond to three of Titian's masterpieces — Diana and Callisto, Diana and Actaeon (cover image), and The Death of Actaeon, which themselves were inspired by Ovid's Metamorphoses. Among the poets are names both well-known and, perhaps, not so well-known to American readers: Simon Armitage, Carol Ann Duffy, Seamus Heaney, Jo Shapcott, and Patience Agbabi, Wendy Cope, Lavinia Greenlaw, Tony Harrison, Frances Leviston, Sinead Morrissey, Don Paterson, Christopher Reid, George Szirtes, and Hugo Williams. 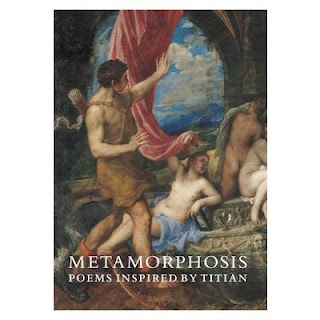 Each ekphrastic poem is illustrated with a full-color image of one of the Titian works. Nicholas Penny, formerly senior curator of Sculpture at our National Gallery of Art in Washington, D.C., and now director of the National Gallery, London, contributed the Introduction. To see sample pages from the book, go here (pdf). The book may be ordered through the National Gallery's online Shop Art. This edition of Saturday Sharing is meant to inspire. You might want to start at Picturing Peace before heading to Nina Katchadourian's for Sorted Books, Words without Borders for Japanese fiction and poetry, or comics at Fantagraphics. Just don't miss the city made of type or Yi Zhou's beautiful short. ✦ Here's a gallery of book spine poems, compiled earlier this year. Artist Nina Katchadourian has an ongoing project (it began in 1993), Sorted Books, that has produced some delightful results. Lots of fun! ✦ The online Words without Borders, whose July and August issues feature fiction and poetry from Japan, features graphic lit from around the world. ✦ Picturing Peace, a project of the City of Minneapolis Department of Health and Family Support and the city's Downtown Improvement District, is a collaborative community engagement and photography project exploring issues of youth violence, peace and safety, and community support. A Picturing Peace Exhibit is touring county libraries this summer and fall. Go here to see how a dozen teens photographed their perspectives on pace and safety. ✦ Seattle, Washington, is home to one of the most influential publishers of comics: Fantagraphics Books. A sister site is The Comics Journal. ✦ Marvel a little bit at Hong Seon Jang's Type City (2012), comprising letterpress on wood panel. ✦ Today's video selection, Yijing3 - Love and Death, is from Yi Zhou, a multimedia artist who lives in Paris and Shanghai. The artist talks about the video here. ✦ The National Academies Press has published Convergence: The Art Collection of the National Academy of Sciences. This is the first publication to present a selection from the NAS collection, which includes paintings, prints, sculpture, and photography. Contributors of essays include E.O. Wilson and Lucy Lippard. ✦ Can you help? The North American branch of the International Network for the Conservation of Contemporary Art is seeking the public's help in locating, documenting, and photographing Tony Smith sculptures. The 100th anniversary of Smith's birth is September 23. The INCCA's first Artist Research Project launched August 1. ✦ Wondering whether it's worth your time to download museum iPad apps? ArtInfo reviews 10 apps. Additional videos about the exhibition include Setting Up Monet's Garden, Installing Photographs of Giverny in the Ross Gallery, Monet's Garden in the Nolen Glasshouses, and Monet's Garden with Prof. Paul Hayes Tucker. In the latter (also on Vimeo), Tucker discusses Monet's life and work at Giverny. ✭ Nell Blaine (1922-1996) still lifes (oils, watercolors and pastels) are on view through October 13 at Tibor De Nagy Gallery, New York City. A selection of preview images from "A Glowing Order" begins here. ✭ In Memphis, Tennessee, the Metal Museum continues through December 2 "Master Metalsmith: Eleanor Moty", who is credited for introducing photoetching into metalsmithing. Moty is the museum's Master Metalsmith for 2012. ✭ Still Point Art Gallery is presenting a new online exhibition "Elements of Art: Texture" through November 6, 2013. The image gallery begins here. The exhibition's "Artists of Distinction" include painter Linnea Heide, fine art photographer Patrick Linehan, and ceramist Jarred Pfeiffer. ✭ New York City's NoHo Gallery opens October 2 with a show of work by colorist Joy Saville, an artist who pieces cotton, linen, and silk in beautifully impressionistic fabric constructions. The exhibition "Still" will run through October 27. ✭ A stellar group of artists, Rosemary Feit Covey, Nathaniel Donnett, Victor Ekpuk, GA Gardner, Laurel Hausler (one of my favorites), Mario Andres Robinson, and Vonn Sumner, is featured in "Works with Paper", on view at Morton Fine Art, Washington, D.C., through October 9.
of joy which delivers you from anguish. The National Gallery of Art's "Joan Miro: The Ladder of Escape" concluded in August. In addition to featuring approximately 120 paintings, drawings, sculptures, and prints from the celebrated artist's long career, the exhibition offered the video appearing below. It's a brief (19:18 minutes) but informative overview of the painter's life, artistic process, and styles. Produced by NGA, the film looks specifically at the effects on Miro's career of the Spanish Civil War, the Franco regime and facism, and World War II. It includes original footage shot in Catalonia and Barcelona, archival footage and photos, and a selection of images of Miro's paintings and sculpture. The video also is available at iTunes. of names that describe the size of the community. . . .
Cuban-born, Philadelphia-based artist Alex Queral, who originally had a professional career as a jazz guitarist, painstakingly sculpts phonebooks, using an X-ACTO® knife, acrylic medium, and his imagination. Out of the masses of names he carves bas-relief portraits of people we all recognize, among them Georgia O'Keeffe (Flower Child), Frank Sinatra (Chairman of the Board), Albert Einstein (It's All Relative), David Bowie (The Man Who Feel to Earth), and Salvador Dali (Dali). Queral is represented exclusively by Projects Gallery, which offers some of his one-of-a-kind work as photographic images. Queral's art has been on view at Philadelphia Airport and in other venues in the United States, and has been exhibited in Mexico, Canada, and the United Kingdom. The subject of dozens of articles, Queral's "phonebook heads" also are in Ripley's Believe It or Not collections. the raven. . . rising. I wrote this poem last Tuesday, on 9/11. Go here to see the beautiful and inspiring paintings, drawings, and watercolors of my friend, the artist Walt Pascoe. and the poets to come. Marie Howe was appointed in late August to serve as New York's tenth State Poet. Her term runs through 2014. She succeeds Jean Valentine, who served from 2008 to 2010, the subject of this post. Information about the position of State Poet is found in my post about Valentine. Poetry saved my life. . .
and dying at the same time. . . .
so that everything can be contained in the human heart. ~ Marie Howe in "Backchat: Marie Howe in Conversation"
Marie Howe has published three collections of poetry: The Kingdom of Ordinary Time (W.W. Norton & Co., 2008; paperback, 2009), a finalist for a Los Angeles Times Book Prize; What the Living Do (W.W. Norton, 1998; paperback, 1999), an elegy for her brother John who died from AIDS, named by Publishers Weekly one of the five best books of poetry published in 1997; and The Good Thief (Persea Books, 1988), winner of the 1987 Open Competition, National Poetry Series. Howe also is co-editor (with Michael Klein) of In the Company of My Solitude: American Writing from the AIDS Pandemic (Persea, 1995), an anthology of essays, memoirs, and letters. In addition, she is a contributor to The Writer's Notebook: Craft Essays from Tin House (Tin House Books, 2009) and Crossing State Lines: An American Renga (Farrar, Straus & Giroux, 2011), proceeds from sales of which benefit America: Now and Here. The Rochester-born Howe, who was 30 when she began writing poetry "seriously", was mentored by the late Stanley Kunitz, New York's first State Poet and the 10th and 22nd U.S. Poet Laureate, who called her work "luminous, intense, eloquent". Howe's writing is lyrical, often deeply personal, yet also straightforward, encompassing the everyday, the broken, the ordinariness of life, the physical, experienced world. Broadly, her subjects and themes include family, relationships, motherhood, attachment, illness, loss, grief, joy and pain, living and dying, love, community, sin and redemption, time and its use, remembering, change and transformation. While she has been tagged "metaphysical poet", Howe grounds her poems in details of domestic life: the kitchen sink "clogged for days" and "crusty dishes. . . piled up / waiting for the plumber I still haven't called" (from "What the Living Do"), driving "on bad ice, when it occurs to you / your car could spin, just before it slowly begins to spin" (from "Part of Eve's Discussion"), "the garbage trucks outside / already screeching and banging" (from "Prayer"), the copper beech that "wore that yard like a dress, / with limbs low enough for me to enter it / and climb the crooked ladder to where / I could lean against the trunk and practice being alone" (from "The Copper Beech), the cocktail party where "someone. . . is skewering / a small hot dog with a toothpick" and "the hostess emerges carrying a tray / and announcing a game of charades" (from "The Fourth Visit"). Poems by Howe have appeared in many print and online literary journals and periodicals, including The Agni Review, The American Poetry Review, The Atlantic, New England Review, The New Yorker, The Partisan Review, The Writer's Almanac, Harvard Review, Ploughshares, and Poetry. Her essays and brief articles have appeared at O, Ploughshares, and elsewhere. Howe is the recipient of fellowships or grants from the Bunting Institute at Radcliffe College, Guggenheim Foundation, Massachusetts Artist Foundation, and National Endowment for the Arts. Her other awards include the Peter I.A. Lavan Younger Poet Prize (Academy of American Poets). She was the 13th Florie Gale Arons Visiting Poet, Newcomb College Institute of Tulane University (2011), and a resident at The MacDowell Colony (1987). The poet teaches at the undergraduate and graduate levels at Columbia University, from which she received her master's degree, Sarah Lawrence College, and New York University. we make between us, partly cloudy. . . . The poem "False Spring" is in Austen's wonderful collection Every Dress a Decision (Blue Begonia Press, 2011). Today's edition of Saturday Sharing features links for teens who want to Do Something; creatives willing to be part of a Makeshift Society; and poetry-lovers who want to rock and roll with Patti Smith. A video with Mark Nepo asks us all to consider "the art of putting things together". ✦ If you write and haven't been reading Full Stop, take a look. In addition to interviews and book reviews, you'll find fiction, essays, booklists, and a book club. ✦ Thirteen episodes of Rabbit Light Movies: A Journal of Poemfilms, dated between 2007 and 2011, have been archived online. The list of poets who contributed to Rabbit Light Movies, which concluded in December 2011, is impressive. A more recent venture into poemfilms is The Volta. ✦ Patti Smith fans will love this UbuWeb archive of the poet's readings from 1971, 1973, and 1974. Mark Nepo - The Art of Putting Things Together from Sounds True on Vimeo. ✦ One look at the handcut paper and acrylic koi of Australian Lisa Rodden will leave no doubt that this artist knows how to wield a pair of scissors. ✦ Graphic designer Andrew Gorkovenko uses tea to illustrate country of origin. He's also designed creative packaging for tea. See more of Gorkovenko's work here. ✦ Art and technology combine beautifully in the work of Los Angeles-based artist Guillermo Bert, who uses QR ("quick response") barcodes in his "Encoded Textiles" project to raise awareness about the culture and traditions of Chile's indigenous Mapuche. Bert has transcribed Mapuche stories, poems, and narratives into graphical QR codes, which then are made into woven tapestries. See Wired magazine's interesting article about Bert's project. A campaign to fund Okapi Films' Coded Stories, which will document Bert's project and use his encoded artworks, was undertaken successfully on Kickstarter (the effort concluded in July); the filmmakers plan to wrap up production this fall. If you're in Pasadena, California late next month or this winter, plan to see "Guillermo Bert: Encoded Textiles" at the Pasadena Museum of California Art; the exhibition opens October 28. ✦ Art can light up your life. If you're in New York City's Madison Square Park this fall you won't be able to miss Leo Villareal's Buckyball. The artist's large-scale installation, which comprises 180 LED tubes throughout which are programmable color pixels, will be on view beginning October 25. See it anytime through February of next year, and you'll come away glowing. ✦ Today's video, Tough Life Diary, is an engrossing 14:21-minute interview with artist Nancy Grossman, who talks frankly and insightfully about her life and art. The video, which includes family photos and archival film footage, accompanied at exhibition earlier this year of Grossman's work at Tang Teaching Museum and Art Gallery, Skidmore College. ✭ In "Century of the Child: Growing by Design, 1900-2000", on view through November 5, the Museum of Modern Art, New York City, examines school architecture, clothing, playgrounds, toys and games, nurseries, furniture, political propaganda, books, and children's hospitals and safety equipment. The exhibition link above takes you to a dedicated, interactive site where you may explore, chronologically and in other ways, the design ideas, objects, and practices underlying a century's preoccupation with children's development and well-being. Lectures, gallery talks, symposia, film screenings, and other related events are scheduled during the exhibition. ✭ The Rhode Island School of Design, Providence, continues through October 21 the first solo museum exhibition in the United States of Dan Walsh's large-scale abstract canvases. "Dan Walsh: UnCommon Ground" showcases just eight paintings, all created for the site, and three limited-edition books Walsh designed and made by hand. Of the latter, Walsh has said, "A problem solved in a book might make it into a painting. On the other hand, the books are an outlet for my ideas that maybe don't belong in my paintings." ✭ In Savannah, Georgia, the Jepson Center, part of Telfair Museums, continues "Blown, Assembled and Cast", its celebration of the 50th anniversary of the Studio Glass Movement in America. On view through October 28 are approximately 30 pieces from the museum's studio glass collection, as well as works from several collectors. As the show's title indicates, the exhibition looks at the techniques of blowing, casting, and assembling glass, using as examples works by Dale Chihuly, Jose Chardiet, Stephen Dee Edwards, Jon Kuhn, David Levi, Dante Marioni, Charles Miner, and Bertil Vallien. On October 18, a talk is scheduled with glass artists Charles Miner and Therman Statom, who created in 2006 a custom-built glass house for the Jepson Center's interactive children's space, ArtZeum. On October 19, Statom will lead a glass sculpture workshop for high school students and, on October 29, local glass artist Jon Poirer, owner of Drayton Glass Works, will offer several brief glassblowing workshops. Contact the museum for details. ✭ To celebrate its centennial, New Orleans Museum of Art commissioned a site-specific mural by Nigeria-born Odili Donald Odita, now resident in Philadelphia. Titled "Forever", the mural is on view in the first floor elevator lobby through October 7, 2013. A brief video with the artist is here. On October 12, the National Museum of Women in the Arts, Washington, D.C., opens "Fabulous! Portraits by Michele Mattei". The exhibition, which will be on view through January 6, 2013, will feature portraits of women who have devoted their lives to the arts. A celebrity photographer as well as a photojournalist, Mattei, according to her Website, also has co-written and co-prodouced a video, The Longest Holiday, on the joys of aging, and is the author of My Fair Ladies, images from which may be seen under the heading "project" here. Mattei's images of butterflies and flowers are extraordinary. I shall remember the Monarchs. . . . The 50th anniversary of the publication of Rachel Carson's Silent Spring is Thursday, September 27, and organizations across the United States and abroad are partnering on "Celebrating Silent Spring at 50". One of the partnering organizations is the nonprofit Borderbend Arts Collective, which is presenting "Silent Spring & Autumn 2012" as part of the Seventh Annual Chicago Calling Arts Festival. It is encouraging participation at all levels in each of our 50 states. Contributions of poetry and other forms of writing, music and other audio recordings, video, and visual and multidisciplinary artwork are welcomed for the anniversary Website. If you would like to contribute directly, send an e-mail to: info[at]borderbend[dot]org and include in the subject line the words "Silent Spring/Chicago Calling". ✦ Organize a Silent Spring reading or other related public event (poetry reading, concert) for September 27. ✦ Write a poem or a song or create a painting inspired by Silent Spring or some aspect of Rachel Carson's legacy and share it on your social media sites. 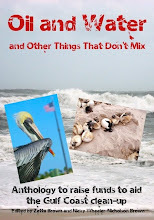 ✦ Write a blog post about Rachel Carson's legacy or why her work inspires you. ✦ Organize an exhibition of artwork inspired by Rachel Carson's legacy. ✦ Have your book club read and discuss Silent Spring. ✦ Explore what your community, county, or state is doing to promote environmentally sound practices. ✦ Suggest your child's school mark the event with a brief talk by a local environmentalist or perhaps a parent involved in environmental initiatives, and with readings of children's books about Carson (e.g., A Clean Sea). Plan to include a hands-on educational event related to stewardship of our planet. Have the children create posters or other artwork that reflects what they have learned. ✦ Urge your local newspaper to publish feature articles about Rachel Carson, her advocacy and legacy, and what remains to be done to sustain the environmental movement and clean up our planet. ✦ Urge your local library to mount a Silent Spring-related exhibition of Rachel Carson's books, which include, in addition to Silent Spring, The Sea Around Us, The Edge of the Sea, The Sense of Wonder, and Under the Sea-Wind. ✦ Organize a walk or run to raise funds for a local environmental group and to raise awareness about the harmful effects of toxic chemicals. ✦ Sponsor a presentation by your local wildlife agency to educate the public about the costs of pollution and environmental degradation to animal and plant life. ✦ Make a donation to a national, state, or local organization charged with championing causes that protect the environment. "2012 Rachel Carson Legacy Conference: Our Planet and Our Health — The Impact of Silent Spring After 50 Years", Chatham University, Pittsburgh, Pennsylvania, October 26, 2012, 1:00 p.m. - 5:00 p.m.